With Spring in full effect, warmer weather has invaded the streets and the days of wearing tees all day, everyday, is definitely the move. We’ve styled a lookbook for you to see just how you can rock your tees with other pieces such as various styles of pants, different kicks and alternate forms of hats like bucket hats to baseball caps. With the first look, our model is wearing a Lath t-shirt that has a large overall graphic taking up a quarter of the right side of the shirt, paired with a bucket hat and American Stitch joggers. 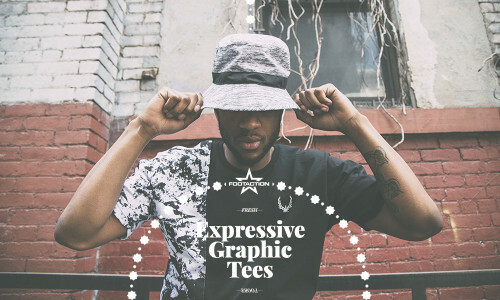 Although the bucket hat and tee both have loud graphics, their similar color palettes allow them to work well together. The black joggers break up the look in all-black, then Odd Sox socks down below are very colorful while being balanced out by some clean Asics with pops of neutral color. The next couple of looks show off our range of graphic tees that we have here at Footaction: the fifth slide shows our model rocking a Hustle Gang tee with a grey Cavs New Era hat and the next slide reveals a Rocksmith long sleeve that we carry with graphics on the sleeves as well as a large graphic to take up the torso. The Rocksmith long sleeve is paired with a clean Detroit skyline cap. Our last looks revolve around our Alife tees: the first one shows off it being paired with a LeBron hat and Nike Jogger Capris and Huaraches, while the last look shows off the Alife tee paired with Levis joggers-jeans, Jordan sneakers and candy hearts socks by Odd Sox. Which is your favorite outfit from this series of styled looks? Let us hear your voice in the comments below. Print article This entry was posted by hhcblog on April 18, 2015 at 9:40 pm, and is filed under Footwear. Follow any responses to this post through RSS 2.0. You can leave a response or trackback from your own site.